The largest single contributor to the UK’s CO2 emissions is space heating of homes, accounting for 60% of domestic energy use. The vast majority of older, hard-to-heat homes have suspended floors which let cold air, dust and mould in from the void below, creating cold draughts and uneven temperatures. Recent studies demonstrate that uninsulated timber floors can contribute as much as one quarter of the total heat loss and a third of the draughts for the whole building. Without retrofit of existing buildings and the insulation of suspended timber floors, it will be almost impossible to meet targets set by the UK’s Climate Change Act 2008. Q-Bot has developed the first affordable solution for retrofitting insulation to suspended timber floors.It works by using a robotic vehicle to insulate the underside of the floor with a polyurethane foam developed and certified for this application. 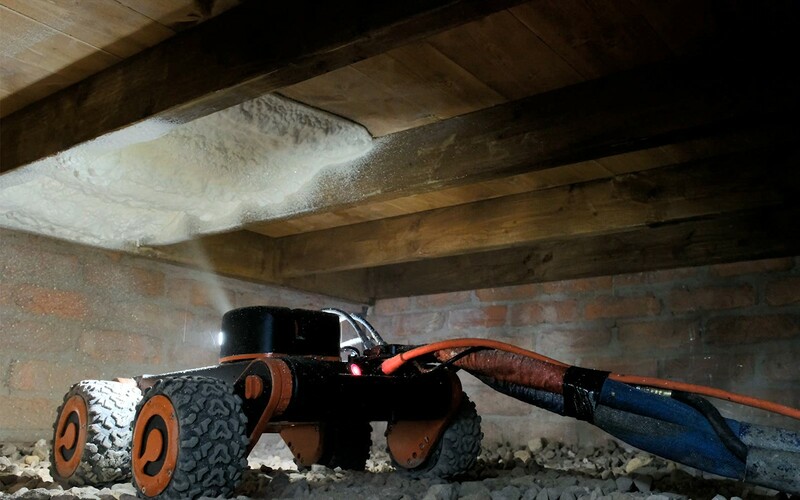 The robot is inserted under the floor through an access hatch or air vent, surveys the void and condition of the floor, if suitable sprays an expanding insulation foam, and finally records the install to verify the area and depth of insulation applied. Applying the insulation in situallows it to expand and fit the shape of the floor, leaving no gaps for draughts to enter the property and reducing the risk of damp and mould – meaning far better results for the building and occupants. Q-Bot’s solution is cheaper, performs better and has none of the hassle and disruption of traditional methods. Independent studies have shown that the insulation resulted in a significant improvement in thermal comfort with less cold draughts and uneven temperatures. The results show on average a 33% improvement in airtightness and an 80% reduction in heat loss through the floor. Q-Bot has been awarded the highly prized BBA accreditation for the installation process (British Board of Agrément Certificate Number 17/5440i1). Q-Bot is currently rolling the service out in the UK with social housing providers. By working with local authorities and housing associations, Q-Bot can quickly create a critical mass in each region that underpins the creation of a delivery channel. This in turn brings jobs and upskills the workforce and can deliver the service to the private market. Q-Bot is currently working with a number of partners to bring the service to Europe and North America, and is developing a number of new solutions to improve the health of our buildings.